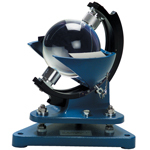 The 240-1070-L Campbell-Stokes Pattern Sunshine Recorder employs a glass sphere to focus the sun's rays to an intense spot, which will char a mark on a curved card mounted concentrically with the sphere. As the earth rotates, the position of the spot moves across the card. When the sun is obscured, the trace is interrupted. At the end of the day the total length of the trace, less gaps, is proportional to the duration of sunshine. The record cards are made from a special board which produces a clearly visible trace even in weak sunlight. 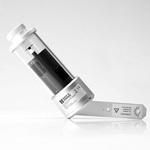 The cards are treated to char rather than burn to ensure clarity of the trace. Different cards are used for different seasons. Each card is marked with hourly intervals.